Learn how a diet of whole natural foods can make you healthier, happier and more energetic than ever! Don't settle for being overweight, unhappy and unhealthy! Embrace the Mediterranean diet and create a body and life that you love! Are you tired of trying diets that just don't work? It works because the Mediterranean diet isn't actually a "diet." Yes, it will help you lose weight and improve your health but it's really more of a lifestyle. It is a way of eating that is based on the traditional dietary patterns of the countries that border the Mediterranean Sea such as Greece, Spain, Israel, Southern Italy and France. Some of the key elements of the Mediterranean diet include eating lots of fresh fruits, vegetables and whole grains, making olive oil your primary source of monounsaturated fat and consuming fish and seafood regularly for their omega-3 benefits. This diet is also extremely low in saturated fats and high in good fats and dietary fiber. Unlike many diets that involve increasing your intake of certain vitamins and minerals, the Mediterranean diet is different in that it allows you to eat a wide variety of foods in moderation. When you eat a well-balanced diet in moderation and exercise regularly as the Mediterranean diet suggests, you will lose weight, revitalize your energy and prevent heart disease, diabetes, arthritis, Alzheimer's, Parkinson's and certain kinds of cancer. It will also help you lower cholesterol levels and blood pressure and improve brain and eye health. 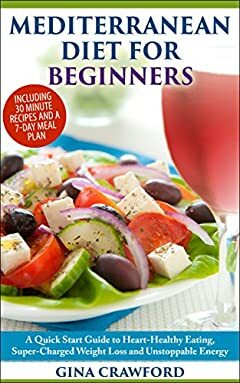 In a step by step way, Mediterranean Diet for Beginners - A Quick Start Guide to Heart-Healthy Eating, Super-Charged Weight Loss and Unstoppable Energy, Including 30 Minute Recipes and a 7-Day Meal Plan is going to teach you everything you need to know about how to successfully apply the Mediterranean diet to your life. You were never meant to feel sluggish, unhealthy and overweight. Choose to change your life TODAY with the amazing health benefits of the Mediterranean diet!